The column ‘Coach you should…’ is back and discusses the El Clasico and coach Pasqual’s board! The column ‘Coach you should…’ discusses Barcelona’s face-off with Real that typically fascinates everyone inside and outside of Spain! 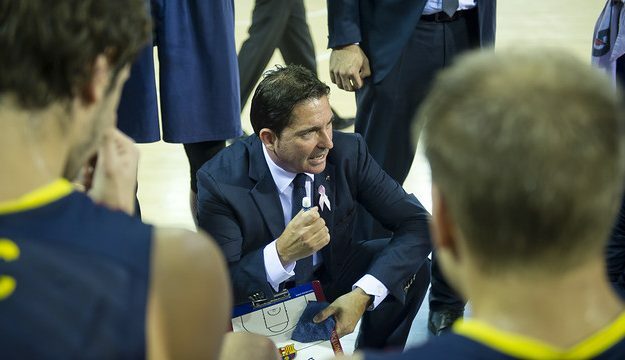 We approach the big game with our attention focused on Xavi Pascual’s coach board! Last year’s crush in the semifinal in Milan, the loss of the cup (this year as well) and the 24-point deficit from the first bout in Madrid is a heavy legacy for Barcelona, one that is not easily digested. It’s a good thing that there’s last year’s championship win to balance out – somewhat – the situation these last couple of years! What should Xavi Pascual aim for so his team can win? Let’s take a look at the 3 most crucial points in terms of tactics, as Eurohoops sorted them out! The first key point concerns the game’s overall pattern. Barcelona is better than Real in half-court set play situations, but the “Whites” are elusive and unstoppable in every transition situation. Pascual has to, and surely wants to minimize the overall possessions of the El Clasico and above all to minimize those possessions where the opponent finds open space on the court. This way, he can control the match and won’t allow Real to get into a demented pace. He’ll be able to keep the score line low and dramatically increase the chances of dominating. It all depends on good defensive returns and right choices in offense, that won’t create an imbalance regarding transitions in defense. Let’s look at the defensive targets. Getting stops or restricting the executing and creative action of the trio Fernandez/ Sergio Rodriguez/ Llull! The three of them together produce 34.5 points out of the 87 that Real scores on average (40%) and have 14.7 of the 22.8 assists (65%+). It’s not by chance that Panathinaikos did so well in this target and easily defeated the queen in Athens. Laso’s team possesses many talented players (Carroll, Reyes with a formidable season, Ayon, Bourousis, Rivers, Maciulis), but if Barca can defuse the trio’s game, they can take the lead. Pascual has certainly realized his offensive targets with a combination of efficient low post play, with good three-point shooting percentages! Two things are needed in offense. A) Tomic (more than anyone) and Pleiss to remain within their scoring averages (17.7 p) and players like Satoransky, Thomas, Doellman to do some additional damage from the low post. B) If this is accomplished and is combined with a 35%+ team average from the three-point line (at the helm of this would be Navarro, Oleson, Abrines, Huertas and Hezonja), Barca will have the omens of victory on her side.